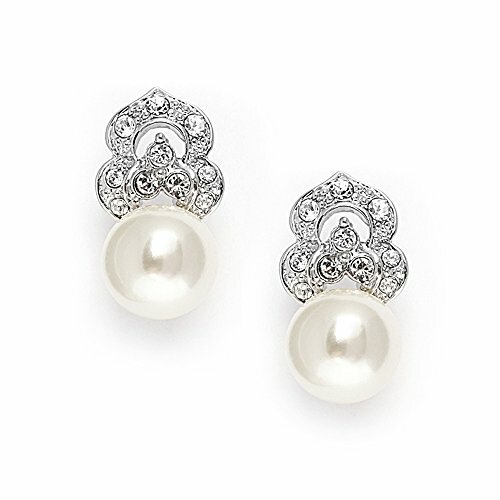 We can't resist the allure and timeless romance of these stunning soft ivory pearl clip earrings with intricate CZ pave details reminiscent of the Art Deco era. At last - beautiful clip on earrings that are as gorgeous as they are comfortable! Each pair of these best-sellers includes comfort-cushion clip backs for day-into-night wear. These Mariell signature vintage pearl wedding earrings feature 8mm glass-based light cream pearls with AAAAA Cubic Zirconia plated in Genuine Silver Platinum. With retro styling and meticulous craftsmanship, no one but you will know these aren't priceless heirlooms. Our top-selling clip on pearl drops are understated beauties perfect for brides, mothers of the bride and party-goers alike. At a fabulous low price, they make the perfect gift for bridesmaids or that special someone. With the look of genuine estate jewelry, our stunning 3/4" h clip earrings are wear-again charmers to enjoy well beyond the special day! We can't resist their elegant "Breakfast At Tiffany's" charm with a Gatsby-inspired antique-reproduction silhouette. Accessorize these non-pierced pearl earrings with our Mariell Designs matching jewelry style 3827B to complete your ensemble, sold separately. We promise you'll adore these ever-popular clip ons or your money-back. Treat yourself or someone you love to the look of genuine pearls and diamonds at a hard-to-believe low price! As always, enjoy Mariell's exclusive Risk-Free Purchase policy and Lifetime Guarantee.